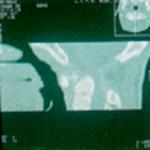 Anterior approach to upper cervical spine through the mouth is now a routine procedure. Excision of tumors like chordomas and plasmacytomas is now possible through this route. Excision of solid unfractured odontoid appears intriguing. Dr. Ramani excise it by Kiel technique. The odontoid is drilled away till its cortical shell remains behind. The shell is then chipped away using 1 mm and 2 mm 45 degrees forward aesculap punches. Drilling the odontoid is done under bright illumination and magnification of microscope and C-arm with marker is liberally used to judge the depth of drilling. Dura starts pulsating once the ligaments are open. Although not necessary it is possible technically to fix a bone graft between clivus and the body of C2. Closure of pharyngeal and palatine musculature and mucus membrane is not a difficult exercise.